How to interface CMOS camera and microcontroller? well, Iñaki Navarro Oiza had made great microcontroller project about it. The camera called c3088 uses a CMOS image sensor OV6620 from Omnivision. 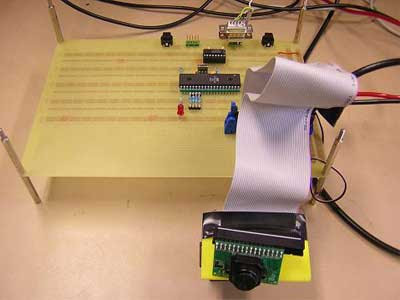 To communicate between microcontroller and camera he use I2C protocol. As processor it used Atmel AVR ATmega16. "The aim of this project is the development and construction of an interface between a CMOS camera and a computer. This interface allows a user to get images from the camera, to change some of the properties of the camera as brightness, luminance, etc from a computer. Also some image process is implemented allowing the camera to track white objects and follow them with a servomotor. The interface was implemented using the Atmel AVR ATmega16 microcontroller."